It has been said that lunch is the easiest meal of the day to blow your healthy habits. 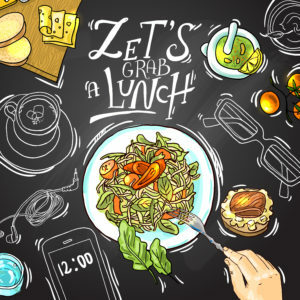 Sometimes we stop following our behaviors and other times we skip lunch altogether. Why does this matter? Think of lunch like recess – it gives your mind a break and helps you re-energize for the day. It raises your blood glucose (sugar) levels, increases your focus, and keeps your metabolism active. 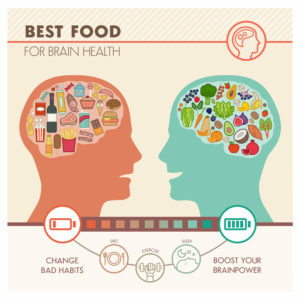 While your brain is only 2% of your body weight, it needs far more energy to operate in comparison to its size. As you’re reading this article, your brain is using glucose to process the information. Your control center relies mainly on glucose (sugar) to operate, but can also use alternative fuel sources in times of need. In fact, the neurons in your brain require significant energy to operate and require a constant supply of it. Glucose is so special to the brain, that has special transporters that carry glucose to into the brain so it can be used. Your brain allows you to think, remember things, and enables you to learn new tasks and skills. Whichever part of your brain is activated, glucose is used by that part of the brain, while other parts reduce their amount being used. It’s pretty incredible when you think about it. When the fuel supplies to the brain are limited or reduced, your brain doesn’t function at full capacity. Have you ever had concentration issues when you haven’t eaten or just have issues processing? Your brain is having its own communication breakdown. 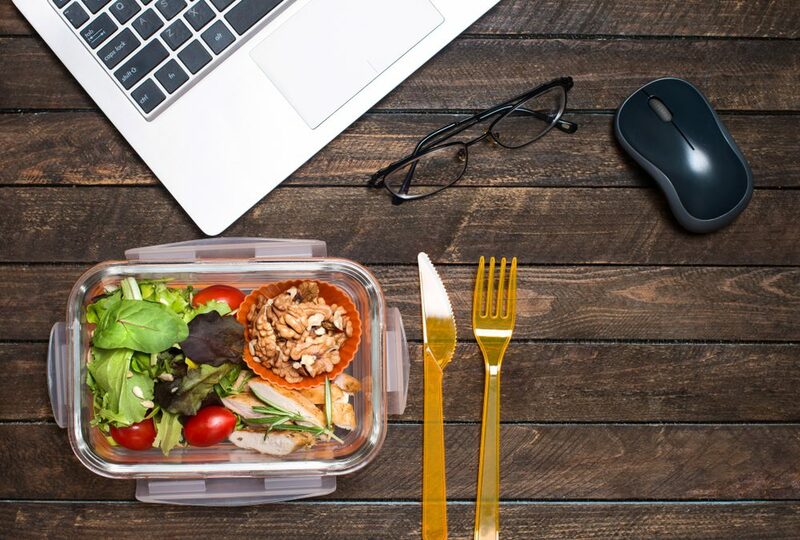 Eating lunch will ensure you can continue to be productive and function normally at your work. This can help make you a high performer at your job. Treat your lunch break like recess and get moving! Take a walk, stand up, and change your scenery. Research shows we tend to eat more calories when we eat by ourselves at our desks. Taking breaks helps maintain concentration and energy throughout the day. Walking for just 10 minutes after lunch can help your body keep your insulin and glucose levels from staying elevated. This will also get your food moving through the digestive system and improve your mental focus and productivity. Pack your lunchbox the way you will eat it. Have a mid-morning break? Pack a healthy snack to enjoy. Packing a snack ahead of time will allow you to enjoy a break and refuel. Try hummus and carrots or fruit and yogurt. Try having a balance of all of the main food groups: grains, vegetables, fruits, lean proteins, and dairy. This will help create long-lasting energy. Bring your lunch from home if your office space has a community fridge. Not only does this give you an opportunity to keep your eating habits and prevent you from eating foods you don’t want to eat, it will also save you money versus going out to eat. Batch cook meals at home to save time and stress from having to decide every day what to pack for lunch. Like salads? Try jarring them. Put wet ingredients at the bottom of a mason jar like dressings/oils and tomatoes, then your choices of greens, topped with other vegetables, seeds, nuts, dried fruits. Add protein to the top as well, or the bottom depending on what source the protein. Don’t have a fridge? 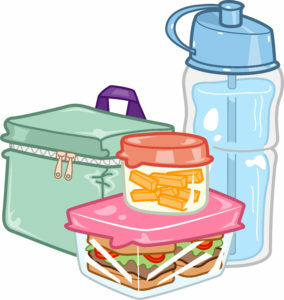 Purchase an ice pack or a lunch bag that can be frozen the night before to keep food cold. Or bring in a thermos with hot soups. Need ideas? Check out this blog article on easy soup recipes! What types of foods could easily bring stored in your desk drawer? Things like trail mixes, nut butter-based sandwiches, and fruits just to name a few. Plan your order before you arrive. Researching meal options ahead of time will help you stick to a healthy choice. You can check the menu options or ingredients before leaving. Focus on color – fill up your plate with fruits and vegetables and eat them first! Ask for substitutes – can your chicken be grilled instead of fried? Can you substitute your fries for a salad? It’s always okay to ask questions! If the bun or bread is white, ask for wheat or whole grains and ask them to hold the butter. Instead of cheese dip, try guacamole, as it is filled with heart-healthy fats. If you like smoothies for lunch, the majority of places will add sugar, or fancy sugar called turbinado. Since fruits are full of natural sugars, you don’t need anything added. Ask them to not put it in your smoothies. Have a game plan and focus on having a balanced meal. Don’t be afraid to get creative – you can take bits and pieces from each station and create your own meal. More and more businesses are focusing on healthier options at work. Some will even reward you for choosing these options! Look for symbols that may represent better choices. Salad bars are plentiful – fill them with color, beans, nuts, seeds, and lean proteins like eggs or chicken. Beware: It’s easy to load on the dressing but one or two thumb-sized servings should be plenty. Don’t forget about your drink! Water is your friend. It helps fill you up, but not with sugar. Drink water with lunch to aid in digestion. It will not only help you digest your food but keep you hydrated. This will increase your focus throughout the day. + Chelsey Boulden is a Rotational Development Associate at Blue Cross NC. + Gabe Staub is a health promotion specialist and wellness program developer at Blue Cross NC.